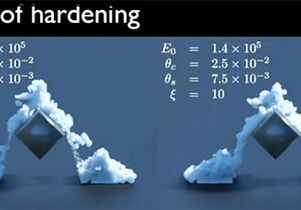 A scene from the animated film, "Frozen," demonstrates what UCLA mathematicians achieved when they worked with Disney software engineers to simulate how snow behaves. On Sunday, "Frozen" won the Oscar for best animated feature. 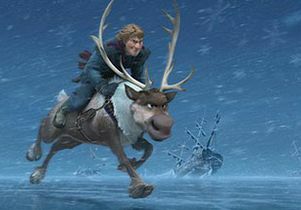 A reindeer pulls a sleigh with Princess Anna and Kristoff, two main characters in Disney’s much-applauded animated movie, “Frozen,” as hungry wolves chase them through a snowy forest. 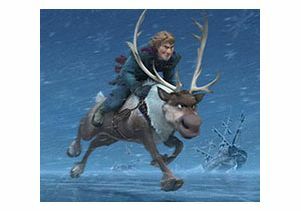 Kristoff falls off the sled, and the wolves nip at his feet, leaving a trail of snow behind him. That’s just one of the bone-chilling scenes in the smash hit that captured the Oscar for best animated feature about a queen who’s struggling to control her magical powers. She makes snow and ice and inadvertently freezes her kingdom. 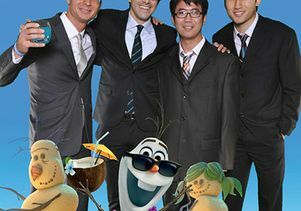 UCLA alumnus Alexey Stomakhin (from the left) and UCLA mathematician Joseph Teran attended the wrap party for the movie, along with two UCLA math students. Far away from the frozen north in sunny Southern California, a UCLA mathematician and a postdoctoral scholar helped create what are arguably the most realistic, animated snow scenes in any film. Millions of moviegoers have seen what resulted from research led by associate mathematics professor Joseph Teran. As consultants, Teran and Craig Schroeder, a UCLA postdoctoral math scholar, joined a team of three Disney software engineers — Alexey Stomakhin, Andrew Selle and Lawrence Chai — to develop an algorithm based on the material point method to create simulations of how snow behaves. Nicknamed the “Matterhorn” at Disney, the algorithm was used in about 43 scenes where characters are interacting with snow. Engineering principles were used to produce a large variety of different kinds of snow, including chunky and powdery forms of the white stuff, as well as to simulate how snow reacts in different situations. In order to do that, Teran and the team did some research and found that a good model to create snow in computer graphics just didn’t exist. But the researchers thought that the material point method could be adapted to recreate snow. So they developed a paper and video on the method and presented it last year at Siggraph, a computer graphics conference. A mathematical illustration of how to simulate snow as it moves under various conditions. Initially, “Matterhorn” was used to simulate snow in only a couple of scenes, Stomakhin said. But the algorithm created such realistic snow that Disney artists ended up using it in many scenes. They even used it to simulate dirt. Watch a video demonstrating the material point method for snow simulation. An explanation of the Matterhorn technology.